If you want to watch NBA TV without cable, you’re in the right place. NBA TV is a must-have cable channel for big NBA fans. The channel typically plays a large selection of out-of-market NBA games, and also regularly plays special programs and documentaries about the NBA. Best of all, you no longer need a pricey cable or satellite TV subscription to watch NBA TV. You can use a number of different online “skinny bundle” internet TV services to get NBA TV and catch all of the best games all-year-long. To find out your best options for how to watch NBA TV without cable, keep reading! fuboTV is a sports-oriented streaming service that launched a few years ago with a focus on soccer, rugby and other international sports – but it also provides some great sports networks, as well as a selection of news and entertainment channels. If you want to watch NBA TV without cable, fuboTV is a pretty good choice. You’ll have to choose between two basic channel packages, both of which include NBA TV. The cheaper, $45/month “fubo” bundle comes with NBA TV, as well as a number of other great channels like Fox Sports, NBCSN, and NFL Network. You can upgrade to the $50/month package to get even more channels like Stadium, for a total of 100+ channels. But though fuboTV does offer NBA TV and a number of other great sports channels, it’s a bit lacking when it comes to coverage of the rest of the NBA. 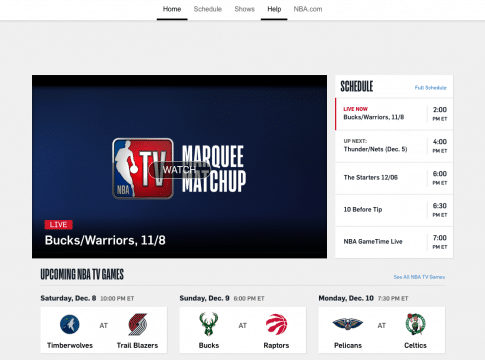 Indeed, you can’t get TNT, ESPN, or any ABC affiliate broadcast stations on fuboTV – so you’ll pretty much only be able to watch the NBA on NBA TV. You also have the option of purchasing an NBA League Pass subscription directly within fuboTV, which is nice for fans who live out of their team’s market. You can watch fuboTV on up to 2 devices at once, which is pretty standard for the industry. And, if you need a third stream, you can pay a $6/month fee for the “Family Share” add-on, which will let you watch on 3 devices simultaneously. Speaking of devices, fuboTV supports just about any device you’d want to stream on, except for gaming consoles. You can stream on your web browser, iOS or Android devices, Amazon Fire TV, Apple TV, Roku, Chromecast, and some Android TV devices. You can give the service a shot with a free 7-day trial now, to see if it’s right for you. Sling TV is one of the oldest internet TV “skinny bundle” services. Owned by DISH Network, it was founded in 2015 as a way to reclaim lost revenue from cord-cutters, with a unique, “A La Carte” business model – and it’s a great way to watch NBA TV without cable. Get the details now. Sling TV has a complicated pricing and package system. Basically, there are two primary options – Sling Blue and Sling Orange. You can also combine both packages into the Sling Orange + Blue package. Sling Orange and Sling Blue carry many of the same channels – there is a lot of overlap between the two. However, some channels are exclusive to one service or the other. You can only get ESPN is through Sling Orange, for example. What this means, in practice, is that to get all of the channels you really want, you’ll probably need to purchase the $40/month Sling Orange + Blue package. However, if you just want NBA TV, you can purchase either Sling Blue or Sling Orange. But here’s where things get even more confusing – to get NBA TV, you must purchase the “Sports Extra” package, which costs $5/month for Sling Orange, and $10/month for Sling Blue. Not only is the price different, but the channels you’ll get are different, too. The Sling Blue Sports Extra package comes with NFL RedZone, for example, while the Sling Orange package doesn’t. Yeah, it’s confusing. You also can’t get ABC or TNT on Sling TV with any package, so you’ll miss out on some nationally-televised and local NBA games. But, like fuboTV, you can also add on an NBA League Pass to your subscription, which will cost you an additional fee, but is a nice feature. Sling has decent features, but understanding them is almost as complicated as understanding the difference between Sling Orange and Sling Blue. Let’s start with simultaneous streams. You can stream Sling Orange channels on 1 device at a time – while Sling Blue channels can be streamed on up to 3 devices at once. These limitations remain in place even if you have Sling Orange + Blue – while shared channels can be streamed on 4 devices, Sling Orange channels, like ESPN, can be streamed on only 1 device. In addition, you don’t get a cloud DVR for free. You’ll have to pay an extra $5/month, which will get you 50 hours of storage space. Device support is easier to understand, though. You can stream on your web browser and on iOS/Android devies, as well as Roku, Chromecast, Amazon Fire TV, Apple TV, select Samsung and LG Smart TVs, and on the Xbox One gaming console. If you’d like to give Sling a shot, you can get started with a free 7-day trial. PlayStation Vue is a good way to watch NBA TV without cable and catch all of the latest action, especially if you have a larger family. It’s on the pricey side but offers a solid selection of sports channels and features. PlayStation Vue offers you the choice of 4 different channel packages, as follows. To watch NBA TV without cable using PlayStation Vue, you’ll need to get the Core package or higher. The Access package doesn’t have NBA TV as an option. For your money, you’ll get NBA TV, your local ABC affiliate, if it’s available in your area, as well as ESPN and TNT. That means you’ll have all of the networks you need to watch pretty much every important NBA game this season andl some extras, like Fox Sports 1 and 2, ESPN2, ESPNU, NBCSN, MLB Network, and more. PlayStation Vue doesn’t just have a great set of channels for streaming the NBA. It also has some great, standout features that put it ahead of the competition, particularly for larger households. First, you can stream on up to 5 devices at once for no additional fee. This is the best simultaneous streaming policy in the entire industry. You can also make up to 10 user accounts, so this is great for families. PlayStation Vue provides an unlimited 28-day cloud DVR. You can save as much content as you want for up to 4 weeks, after which it will be deleted. Usually, this will give you plenty of time to catch up your shows, so it’s a nice feature. Device support is also great – and no, you don’t need a PlayStation to use this service, though the PlayStation 3 and 4 are both supported. Other supported devices include all iOS and Android phones and tablets and modern web browsers, as well as the Apple TV, Chromecast, Amazon Fire TV, and Roku. If you’d like to try it for yourself, you can get a free 5-day trial at the PlayStation Vue website. YouTube TV was launched in early 2017 and has quickly expanded throughout the nation, offering a top-notch selection of channels as well as great features. If you want to watch NBA TV without cable, YouTube TV is sure to be a great option – as long as it’s available in your area. YouTube TV keeps things simple. You’ve only got one package of channels to choose from – a $40/month subscription gets you a total of about 60-70 channels, depending on your region. For your money, you’ll get NBA TV, as well as ESPN, your local ABC affiliate (if available), and TNT – meaning you’ve got your bases covered for all of the major NBA games of the season. The sports channels don’t stop there, though. You can also get MLB TV, NBCSN, CBS Sports, BTN, SEC Network, and a number of regional sports networks. And, like Sling TV and fuboTV, YouTube TV lets you combine an NBA League Pass with your subscription. Beyond the great lineup of channels, YouTube TV also has good features for cord-cutters. The highlight is, of course, the unlimited 9-month cloud DVR. You can save as many shows as you want for up to 9 months, with no other restrictions or limitations. You can also create up to 6 user accounts, each of which gets its own DVR, personalization and recommendation options. You also get 3 simultaneous streams, which is above the industry average. Device support used to be a sore spot for YouTube TV. When it first launched, you could only watch on iOS and Android devices, the Chromecast, and the Chrome web browser. Today, though, YouTube TV is also available on Roku, Apple TV, and the Xbox One, as well as some Smart TVs from Hisense, Sharp, Samsung, LG, and VIZIO. DirecTV Now is owned and operated by AT&T. And while it’s a viable way to watch NBA TV without cable, it’s a bit lacking when it comes to features – and quite expensive. Get the details now. Unfortunately, though, you won’t find NBA TV in the Live A Little package, or the Just Right package. You’ll have to fork over $65/month for NBA TV, making this far and away the most expensive option on our list. You do get NBA TV, ESPN and TNT, though, as well as your local ABC affiliate, which means you’re covered for just about every NBA game. You’ll also get a huge number of other sports channels including Fox Sports, BTN, CBS Sports, NHL and NFL Network, and others. However, the price is still quite steep. We would still recommend DirecTV Now for the price if its features were better. But the service falls quite short. You get a free cloud DVR, but you can only record 20 hours of content for up to 30 days, which is the worst available DVR in the internet TV market. You also can only stream on 2 devices at once, which is fine – but YouTube TV offers 3 streams for $25 less per month. DirecTV Now, on the other hand, will charge you $5/month more to add a third stream. Device support is a bright spot. You can watch on iOS, Android and web browsers, as well as Chromecast, Amazon Fire TV, Apple TV, and Roku devices, so most of your bases are covered, there. Still, the cost is quite high for what you get. You can give the service a shot with a free 7-day trial, though, if you’re interested. One nice thing about modern internet TV platforms is that, in most cases, you can use your internet TV login to watch content directly on a particular channel’s website or app. This is true of NBA TV. You can use the login for any of the above services (with the unfortunate exception of fuboTV) to access the NBA TV website and downloadable NBA TV apps. Why bother with doing this, when you can just watch NBA TV directly through your internet TV service? The main benefit is that watching your content on the app or NBA TV website means you won’t use up one of your device streams. For example, if you have Sling Orange, you can only stream on one device at once. So if you use the NBA TV website or app to watch the game, someone else in your household or family can watch Sling Orange. This is a nice way to make your streaming experience more flexible.